Many people believe that a business is about making money. This is a false notion made worse by our inadequate and misleading accounting systems. A business is an organizational construct that redistributes value by enabling interactions between two or more stakeholders. 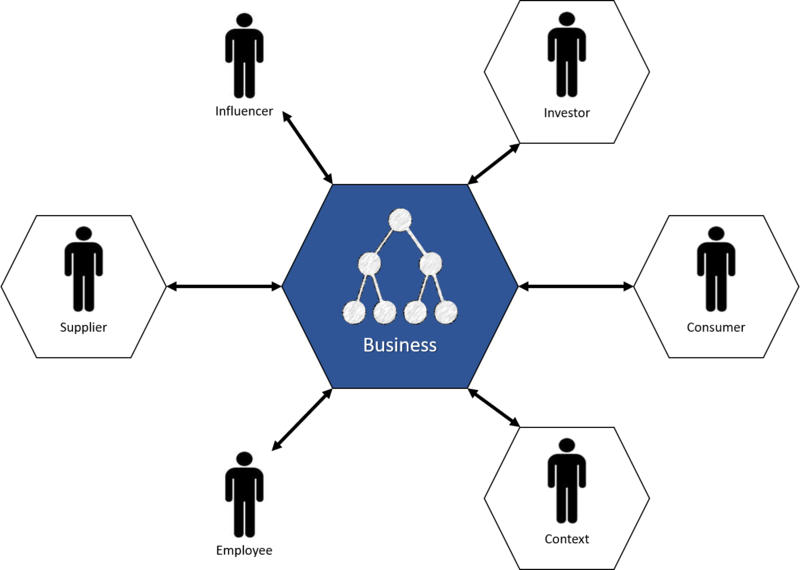 The above sketch illustrates the relationship between a business and a variety of stakeholders. There’s no assertion that this is a complete list or that all businesses have relationships with all of these categories of stakeholders. It’s useful to examine the interactions between these stakeholders and the business. Consumers may be individuals, other businesses, or other kinds of organizations1. Businesses produce some form of product2 that satisfies a consumer’s (a.k.a. customer’s) need or needs. In exchange the consumer generally provides that business with money. This can be much more complex though and the distinction between consumer and supplier can get very muddled. Take any sort of publishing business (e.g. Facebook). There are two tiers of consumers. The first tier includes individuals generally acting in their own interest. They have a need to interact with others. Facebook provides a mechanism for enabling this interaction. It does not ask for money in exchange for providing this service rather it asks for access to an individual’s buying power and access to their social network. It resells the buying power to other businesses (i.e. advertising), the second tier of consumer, in exchange for money and utilizes the social network to expand its supply of buying power to resell. The social networks also enhance the value for the first tier of consumer by improving the ability to interact with others. It’s a repeatable and very scalable system. As illustrated, the interactions between a business and a stakeholder (or stakeholders) can be very complex. If your accounting system only accounts for money then you and other interested parties are driving nearly blind. You need an accounting system that accounts for tier 1 satisfaction with the product that they’re receiving (e.g. interacting with others) and the quality and quantity of buying power provided to tier 2 consumers. In addition, you’ll likely want to track the quality and quantity of the social network asset that is really at the heart of your business. If you only accounted for cash flow from tier 2 consumers then you would likely not have any insight into why it is rising or falling. Basically, your business would be run on luck and chance. Sadly, I can only write so many words on a Sunday morning. I’ll try to build on this with future posts. Tagged Accounting, Business, Consumer, Facebook, Stakeholder.